First-half goals from Jay Rodriguez and Dean Marney gave Eddie Howe his first win as Burnley boss and only the club's second away victory of the season. Burnley scored on 31 minutes when Daniel Fox crossed for Rodriguez to fire home a right-footed shot. John Utaka levelled the score two minutes later with a right-footed shot after good skill from Kanu. But Marney's superb overhead kick eight minutes before half-time proved to be the decisive strike. 90:00+4:21 The referee ends the match. 90:00+1:40 Ibrahima Sonko challenges Clarke Carlisle unfairly and gives away a free kick. Lee Grant takes the free kick. 90:00+1:20 Liam Lawrence crosses the ball, Clarke Carlisle manages to make a clearance. 90:00+0:48 Joel Ward sends in a cross, clearance made by Michael Duff. 90:00+0:02 Substitution Graham Alexander joins the action as a substitute, replacing Chris Eagles. 89:26 Ibrahima Sonko concedes a free kick for a foul on Wade Elliott. Tyrone Mears takes the direct free kick. 88:40 Inswinging corner taken right-footed by Liam Lawrence, Clarke Carlisle makes a clearance. 88:40 Substitution Jonathan Hogg goes off and Hermann Hreidarsson comes on. 87:42 Free kick awarded for a foul by Michael Duff on Liam Lawrence. Direct strike on goal from the free kick comes in from Liam Lawrence. 87:42 Booking The referee books Michael Duff for unsporting behaviour. 87:11 Handball by Dean Marney. Free kick taken by Liam Lawrence. 86:33 Substitution Chris Iwelumo replaces Steven Thompson. 85:20 The ball is sent over by Liam Lawrence, Clarke Carlisle manages to make a clearance. 78:46 Foul by Dean Marney on David Nugent, free kick awarded. Liam Lawrence crosses the ball, Jonathan Hogg takes a shot. Save made by Lee Grant. 77:50 John Utaka has an effort at goal from the edge of the area that misses to the right of the target. 77:20 The ball is swung over by Wade Elliott, Headed effort from inside the penalty area by Steven Thompson misses to the right of the target. 76:43 Free kick awarded for a foul by David Nugent on Daniel Fox. Direct free kick taken by Daniel Fox. 74:36 Jonathan Hogg fouled by Dean Marney, the ref awards a free kick. Liam Lawrence takes the free kick. 72:36 Corner taken by Liam Lawrence from the left by-line, Greg Halford gives away a free kick for an unfair challenge on Clarke Carlisle. Free kick taken by Lee Grant. 72:09 Outswinging corner taken from the right by-line by Liam Lawrence, clearance made by Steven Thompson. 70:12 Daniel Fox produces a cross. 69:04 John Utaka is ruled offside. Lee Grant restarts play with the free kick. 66:58 Corner taken by Daniel Fox from the left by-line, save by Jamie Ashdown. 66:43 Jay Rodriguez takes a shot. Save by Jamie Ashdown. 65:56 Inswinging corner taken left-footed by Daniel Fox played to the near post, Greg Halford manages to make a clearance. 65:19 The ball is swung over by John Utaka, save made by Lee Grant. 63:07 Substitution Carl Dickinson replaces Nwankwo Kanu. 62:29 Corner taken right-footed by Liam Lawrence from the right by-line, Greg Halford sends in a cross. 62:11 The assistant referee signals for offside against Jack Cork. Indirect free kick taken by Jamie Ashdown. 61:14 Inswinging corner taken right-footed by Wade Elliott from the left by-line, clearance made by Ritchie De Laet. 59:38 Inswinging corner taken from the left by-line by Liam Lawrence. 59:06 Free kick awarded for a foul by Dean Marney on Nwankwo Kanu. Liam Lawrence takes the direct free kick. 57:37 Nwankwo Kanu concedes a free kick for a foul on Michael Duff. Lee Grant restarts play with the free kick. 56:05 The referee blows for offside. Free kick taken by Daniel Fox. 54:27 The assistant referee flags for offside against Steven Thompson. Jamie Ashdown restarts play with the free kick. 52:45 Unfair challenge on Daniel Fox by Liam Lawrence results in a free kick. Lee Grant restarts play with the free kick. 51:57 Chris Eagles produces a right-footed shot from just outside the box that goes wide right of the target. 45:00+2:06 The referee blows for half time. 45:00+0:42 David Nugent produces a right-footed shot from just outside the box that misses to the right of the target. 43:02 Outswinging corner taken by Liam Lawrence. 42:56 The ball is delivered by Joel Ward, clearance by Clarke Carlisle. 41:54 Michael Duff concedes a free kick for a foul on John Utaka. Liam Lawrence delivers the ball from the free kick right-footed from right channel, Steven Thompson makes a clearance. 40:41 Shot by David Nugent. Save by Lee Grant. 38:28 Jack Cork gives away a free kick for an unfair challenge on Ritchie De Laet. Liam Lawrence delivers the ball from the free kick right-footed from left channel, Michael Duff makes a clearance. 38:28 Booking Jack Cork is shown a yellow card. 37:41 The ball is swung over by Ritchie De Laet. 36:35 GOAL - Dean Marney:Portsmouth 1 - 2 Burnley A goal is scored by Dean Marney from inside the penalty area to the bottom right corner of the goal. Portsmouth 1-2 Burnley. 36:03 Steven Thompson takes a shot. Save by Jamie Ashdown. 34:55 Unfair challenge on Dean Marney by Hayden Mullins results in a free kick. Lee Grant restarts play with the free kick. 32:50 Assist on the goal came from Nwankwo Kanu. 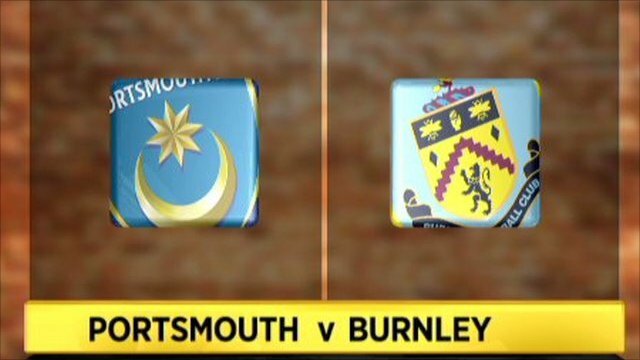 32:50 GOAL - John Utaka:Portsmouth 1 - 1 Burnley John Utaka gets on the score sheet with a goal from just inside the penalty area to the top right corner of the goal. Portsmouth 1-1 Burnley. 30:59 Assist on the goal came from Daniel Fox. 30:59 GOAL - Jay Rodriguez:Portsmouth 0 - 1 Burnley Jay Rodriguez fires in a goal from inside the six-yard box low into the middle of the goal. Portsmouth 0-1 Burnley. 28:15 Foul by Dean Marney on Nwankwo Kanu, free kick awarded. Free kick taken by Liam Lawrence. 22:15 Hayden Mullins has an effort at goal from just outside the box which goes wide of the left-hand upright. 21:47 Chris Eagles produces a cross, save made by Jamie Ashdown. 21:01 The ball is sent over by Liam Lawrence. 19:28 Inswinging corner taken by Daniel Fox from the right by-line, save made by Jamie Ashdown. 18:48 Michael Duff fouled by John Utaka, the ref awards a free kick. Free kick taken by Dean Marney. 18:17 Free kick awarded for a foul by Jay Rodriguez on Joel Ward. Jamie Ashdown takes the direct free kick. 16:27 Greg Halford fouled by Steven Thompson, the ref awards a free kick. Greg Halford takes the direct free kick. 15:53 Chris Eagles is flagged offside by the assistant referee. Indirect free kick taken by Jamie Ashdown. 14:17 The ball is crossed by David Nugent, save by Lee Grant. 13:09 Nwankwo Kanu takes a shot. Comfortable save by Lee Grant. 11:27 Inswinging corner taken left-footed by Daniel Fox, Michael Duff takes a shot. Save by Jamie Ashdown. 9:47 Inswinging corner taken left-footed by Daniel Fox from the right by-line to the near post, Nwankwo Kanu manages to make a clearance. 9:01 Free kick awarded for an unfair challenge on Clarke Carlisle by Nwankwo Kanu. Lee Grant restarts play with the free kick. 7:38 Effort on goal by Liam Lawrence from just inside the penalty box goes harmlessly over the target. 6:52 Free kick awarded for an unfair challenge on Jonathan Hogg by Jay Rodriguez. Jamie Ashdown takes the free kick. 6:21 Foul by Nwankwo Kanu on Tyrone Mears, free kick awarded. Direct free kick taken by Tyrone Mears. 5:57 The ball is delivered by Liam Lawrence, comfortable save by Lee Grant. 5:30 Greg Halford fouled by Steven Thompson, the ref awards a free kick. Jamie Ashdown restarts play with the free kick. 2:29 Wade Elliott produces a cross, save made by Jamie Ashdown. 1:26 The referee blows for offside against John Utaka. Free kick taken by Lee Grant. 0:51 The referee blows for offside. Jamie Ashdown restarts play with the free kick.